A Question Plaguing Designers Of Golf Courses All Over The World Is What Makes A Good Golf Course? The Answer, Simplified Greatly, Is The Lay Of The Land It Is Being Built On. A good golf course needs to have rolling hills, preferably a pond or two, or three, or four, or five, trees, an area that can be used as a fairway, an area for a rough, and enough room for sand traps. However, there are a lot of so-called golfers who don' t think a course should have any sand traps at all. They are wrong and the minority. Sand traps can improve both the course and the skills of the golfers who play them. 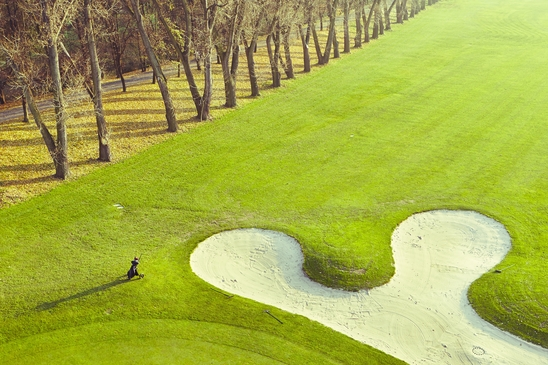 A good golf course should be designed so as every hole is different and unique unto itself. If every hole was straight and four hundred and twenty yards, the course would be boring to play. A good golf course should have holes that dogleg right and dogleg left, with enough obstacles so the flag cannot be seen from the tee box. Good golf courses have elevated tee boxes to help the golfers get more elevation on their drives. Once the ball hits the fairway, the elevation will depend entirely on the skill of the golfer. Another thing that makes a good golf course is the people who work to maintain it. Some courses have professional groundskeepers who have the job of keeping the fairways smooth, the roughs rough and the greens closely cropped. This can make the all the difference in the world to golfers, as can the type of grass used on the green. Speaking of grass on the green, the better golf courses have bent grass greens. This helps keep the ball from rolling off the green once it hits, whereas a green with Bermuda grass, while still a good green, will not have ability to slow the ball down once it hits. Of course, the bent grass greens will wind up with more divots than those with Bermuda grass as the ground tends to be softer beneath them. The attitude of the grounds crew and the personnel in the clubhouse has a great deal to do with whether a golf course is good or not. If the people working there have bad attitudes, the golfers will not be able to focus on their game, as they remember how they were mistreated, or thought they were mistreated. But, a helpful, friendly staff, will make the golfing experience pleasant and enjoyable. Well maintained golf cart paths are also important to having a good golf course. A broken and rough cart path will beat the golfers to death, forcing them to drive on the fairways. While this is not a major problem, it can be a headache. One of the things that makes a poor golf course, is rough terrain. Some golf courses have rocks all over the place. This has a negative affect on the balls once they hit the ground and damages the player's golf clubs.